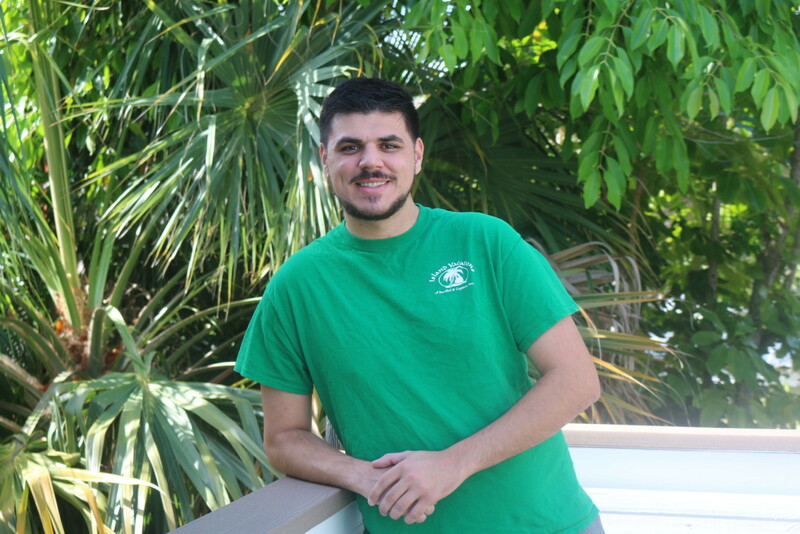 The Island Vacations’ staff are all locals who live & work on or near the island. Our goal is to make you feel right at home so you can experience Sanibel & the surrounding area like a native. We’re here to help make your stay a truly immersive experience. Let us know what you like to do, things you’d like to experience, & ask us what we suggest you discover based on your interests. We’re here to make you feel like a local, not a tourist. 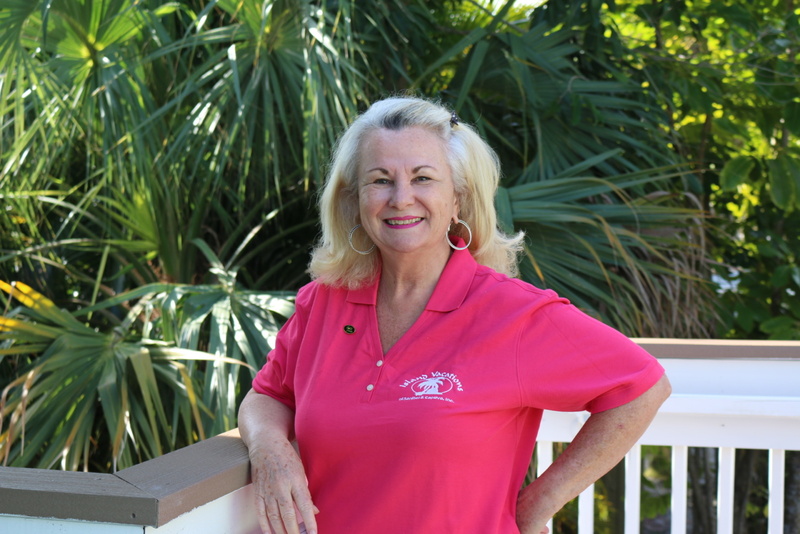 Originally from Long Island, Beth has lived on Sanibel and in the area since 1974. Couples or family: Take a lunch cruise to Cabbage Key or Useppa Island on the Lady Chadwick with Captiva Cruises. You’ll learn about the local history, flora, & wildlife, & best of all, the dolphins will be jumping in the boat’s wake! Bicycle the Island – Learn all the little side streets, bike ‘Ding Darling National Wildlife Refuge, and find the old cemetery near Algiers Park – not accessible by car. Stop along the way at all the shops and restaurants. A long-time resident, Beth is an excellent resource for just about anything you need or want to know! Blue Coyote – Par View Road – Best steak dinner in an upscale environment, she also recommends this location for a formal dining atmosphere. The management & staff treat everyone like royalty. Matzaluna Italian Restaurant – Periwinkle Way – Fun family atmosphere, kids get pizza & spaghetti; parents get a beautiful seafood or steak entrée with a cocktail or local craft beer. The Thistle Lodge – Casa Ybel Road – Romantic feel, building is a replica of a Victorian Mansion & the dining area looks over the Gulf of Mexico. Traders – Periwinkle Way – Wonderful menu of seafood & steaks. It’s upscale, casual feel with entertainment 3 nights a week. Great Happy Hour too! Totally Baked (new on the island) – Periwinkle near Palm Ridge Road. The Sanibel Library – Dunlop Road – is one of the nicest libraries anywhere. Great book & movie selection plus a large computer area for guest use. My favorite sections are the little patios with rocking chairs & tucked away corners where you can sink into the comfy chairs, relax & read. The Bubble Room – Captiva (Andy Rosse Lane & Captiva Dr.) You can get cake “to go” even if you don’t stay for dinner. One slice can easily feed two people, or make it your meal! The Bubble Room is decorated in old time Christmas décor, movie memorabilia & model trains. Enjoy lunch, dinner or beyond or stop in for a piece of cake! She is a great resource for family activities. She has two children of her own and when her family comes to town (and there are a lot of kids) Aimee is the designated activity director. Captiva Beaches – Find one of the public beach access points on Captiva. Bring a blanket & bottle of wine and watch the sunset over the Gulf. Very romantic. Visit the Historical Village – Dunlap Road – for a look back at the way island life used to be. Step into some of the actual buildings, where islanders shopped & went to school. ‘Ding Darling National Wildlife Refuge – San-Cap Road – bike the refuge to get a close look at the variety of birds and animals that vacation on Sanibel, just like you are! Many are permanent residents, but they have “snowbirds” by the thousands visiting annually. Tarpon Bay Explorers – End of Tarpon Bay Road (bay end). Kayak and explore the back bay. A Wisconsin native that found the warmth of Florida about 28 years ago! Visit Periwinkle Park – right next to Island Vacations. They have lots of birds and lemurs that you can see. Ask the ladies at the front desk about times and how to see these exotic animals. Kelly likes the natural setting of the island and will be a good resource for outdoor suggestions. She also has some dining recommendations for you! Traders – Periwinkle Way – Is one of her favorite places to eat. She really likes their food, atmosphere & service. The Mad Hatter – near Blind Pass – is her choice for a romantic dinner. Watch the sun set over the Gulf as you enjoy the fabulous food. Doc Ford’s –Tarpon Bay Road, near Periwinkle – You might rub shoulders with local celebrity, Randy Wayne White, author of the “Doc Ford” series. He often has lunch or dinner at the restaurant. Please respect his privacy. You can purchase his books at the restaurant. Matzaluna Italian Restaurant –Periwinkle Way – Pizza, Italian dishes, a large menu serving beer & wine. Fun, relaxed family atmosphere. Lazy Flamingo – Periwinkle Way –Good choice for salads & seafood sandwiches. Relaxed atmosphere & serves beer & wine. Be sure to explore ‘Ding Darling National Wildlife Refuge. Named after J. N. ‘Ding Darling, the originator of the duck stamp, this is a must see location for birdwatchers & those that love the out of doors. The refuge is closed to cars on Fridays but you can bike the refuge all week. 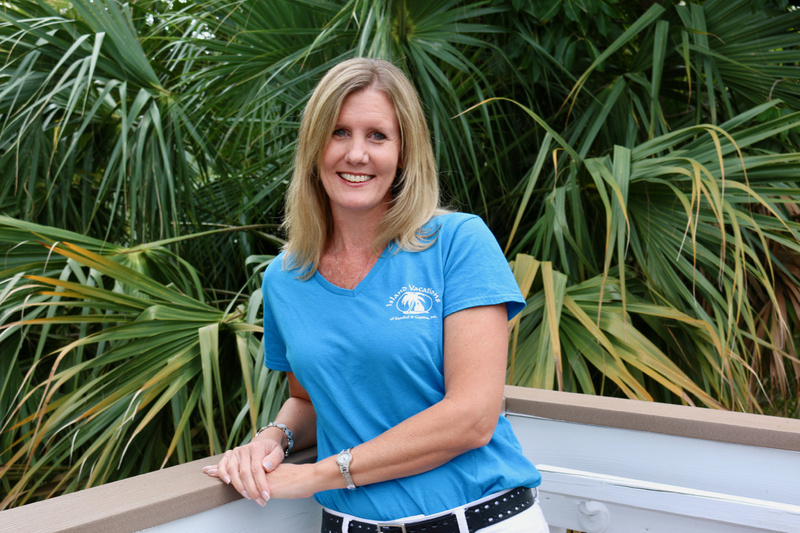 Originally from Ohio, Susan grew up on Sanibel & has lived in the area for 39 years. Depending on what time of year it is, I let them know the best times to travel the island or any special activities going on, like fireworks or parades. 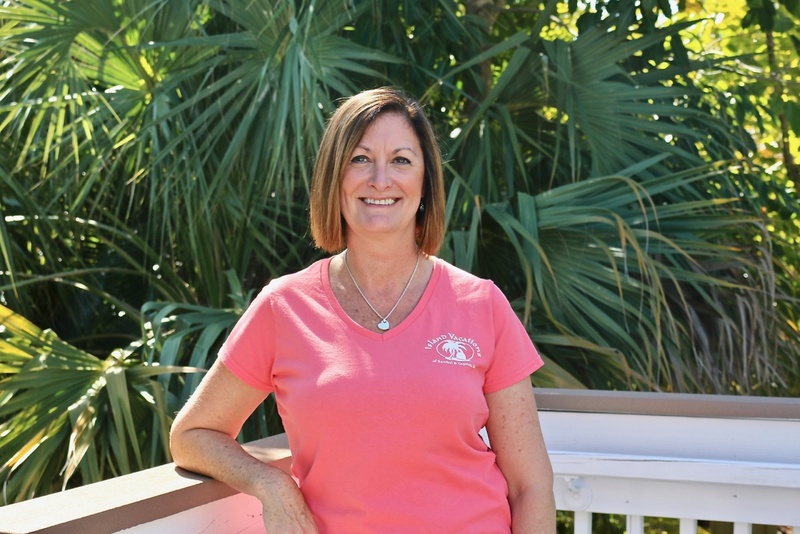 Susan grew up on Sanibel and likes to share her favorite beach locations, has good suggestions on the best places to go, and where to go boating and fishing. She also likes to share her favorite food selections at island restaurants. George and Wendy’s Seafood Grill – Tarpon Bay Road & Periwinkle Way – They just have unique dishes and different specials every day! Island Cow – Periwinkle Way – Great family restaurant. Their menu is so huge! They have something for everyone, even the picky little eaters. The Mad Hatter – San-Cap Road, near Blind Pass – is a good spot for a formal dinner. Thistle Lodge – is her favorite spot for a romantic dinner because it is where she got engaged! Loveboat Ice Cream – Jerry’s Plaza on Periwinkle – for dessert. Just let her know what you like to eat, and she’ll be happy to suggest options based on your preferences. Originally from New York, Lucas has lived in the area for five years. Lucas is originally from New York. He moved to the area five years ago and loves it. His college degree is in Hospitality Management. If the wind is really blowing, head over to the causway and watch the local kite boarders. They are entertaining & thrilling to watch. You may even want to join in the fun! You can take some great video of them as they “fly” close to the shoreline. Bring a chair. They ususally start “sailing” later in the afternoon. You can’t miss their colorful kites as you drive along the causeway. Lucas has a sweet tooth and he can tell you the best places to go for ice cream and fudge. Lazy Flamingo – Two locations, Periwinkle Way near the Island Vacations’ office & San-Cap Road, near Blind Pass – The best fries on the island, hands down. The Sanibel Sweet Shop – Palm Ridge Road, in the same plaza as the Deli – if you like fudge, you need to stop here and have a taste of what they are making. They offer other confectionary delights too; cupcakes, candy & more. Matzaluna’s Italian Grill – Periwinkle Way, near the Island Vacation office – Enjoy a nice pizza or other Italian dinner choices at this casual dining location. They have craft beer on tap, a full bar & a friendly staff to greet you. They are open for dinner. Adventures In Paradise – Get up close and personal with the local sea life when you go on a day excursion with this locally owned, family business. They have convenient pick-up locations close to where you are staying and they’ll bring you home after an informative & enjoyable day on the water! Choose from several different types of cruises that run from morning to sunset. This is a great activity for everyone. They can also arrange fishing charters. The Bailey-Matthews National Shell Museum – Located on San-Cap Road, this is a must stop when you visit Sanibel. They have an extensive shell display, and a live touch tank for all the kids, regardless of their age. They even offer craft classes so you can create your own souvenier from all the shells you’ll pick up as you stroll the beaches! Billy’s Rentals – Has two locations, one is close to our office, the other is located in the Bailey’s Center Plaza on the corner of Tarpon Bay Road and Periwinkle Way. They offer a wide variety of bikes & paddle boards so you can tour Sanibel Island in whatever way you wish. They also offer handicapped wheel chairs for the beach & beach wagons that will roll easily on the sand. With 25 miles of bike paths, Sanibel is a safe place for the entire family to ride. Be sure to check out their Segway tours. 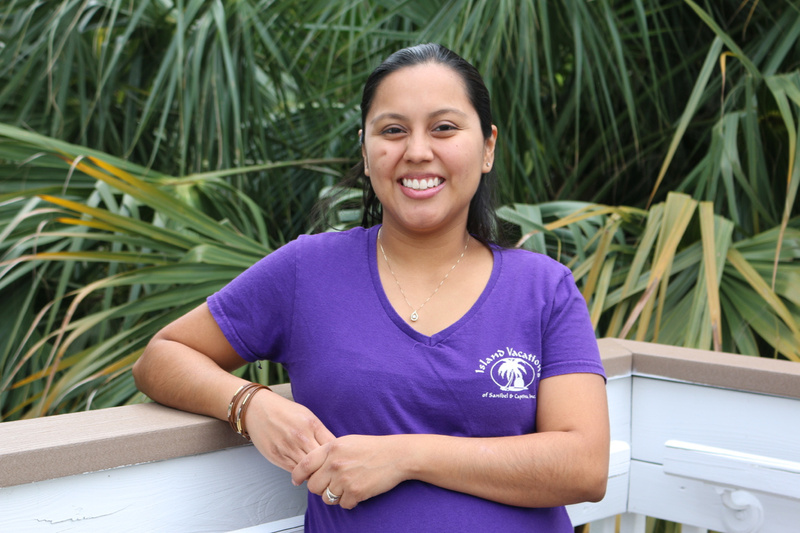 Fran came to Florida with her family when she was five months old, so we consider her a true Florida native! 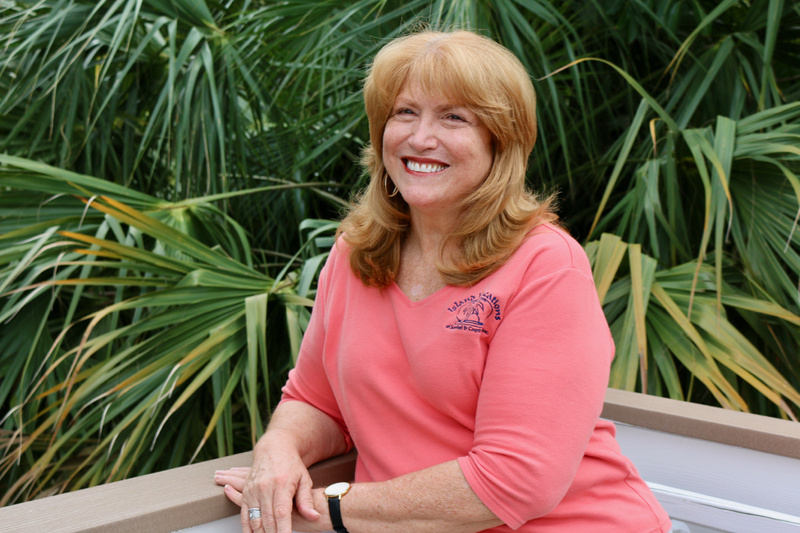 She has been exploring Southwest Florida and combing the beaches for shells for over 50 years. 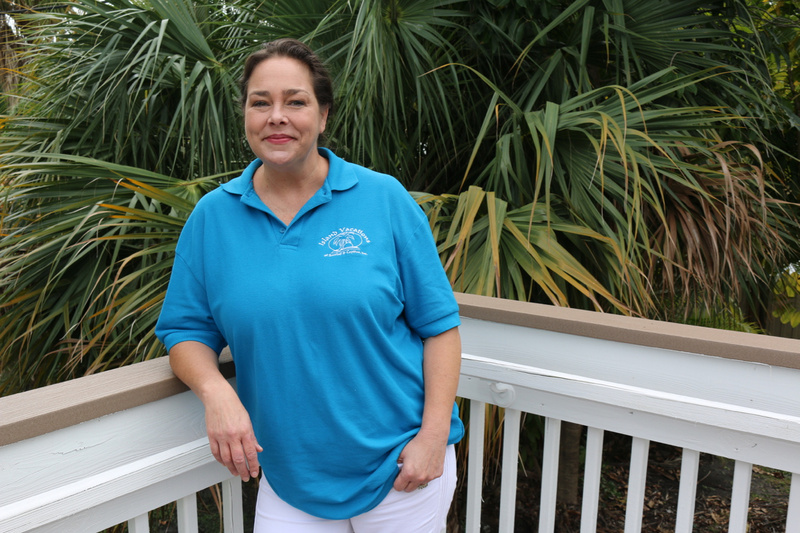 She did leave the islands for a few years, but the lure of the Gulf and island life called her home. Go to the Shell Museum and then go shelling. It makes shelling more interesting when you know what you’re finding! You might find one of the special shells people spend a lifetime searching for; a visit to the Shell Museum will help you identify your finds. Island Vacations can help guests with any of their needs. The Sealife Encounter trip with Adventures in Paradise is exceptionally fun – you can see and touch the things you catch. It’s a learning time and much, much, more! And the trolley will pick you up! Makes for a great time. Fran loves to comb the beaches searching for shells and to fish. She is very proud of her Tarpon catch a few years ago (165 lbs!). Traditions – West Gulf Drive – serves wonderful steak dinners and is a nice place for a formal dinner. Traditions gets Fran’s vote for a romantic dinner as well. For couples, she recommends watching the sunset and then go inside for dinner at Traditions – West Gulf Dr.
Or take the Sunset Cruise with Adventures in Paradise – they pick you up. Experience a Sea life Encounter with Adventures in Paradise – yes, they pick you up for all their cruise adventures. One of the best ways to tour the island is by bicycle. You can rent bikes, surreys, or take a Segway tour of the island at Billy’s Rentals. Biking is a great way to get around.